What project are you working on ? In need of Rocks, Boulders or Crushed Stone? We have all types and colors for whatever your project needs. Rocks and Boulders are sold by the pound or ton. Crushed Stone is sold by the yard. Generally the type or size of rock will determine its pricing. Give your home some ‘curb appeal’! Have your house number engraved into the rock of your choice. Place a rock on your front lawn, surround it with flowers for a beautiful landscape. Not sure how to make that happen….don’t worry - we can help you get that done! Live on the beach? Storms removing your property or sand? We can deliver jetty stone for a barrier or seawall to keep your property from eroding. Tired of the same old diving board? We have Diving Rocks to give your pool a natural look – many shapes and sizes and colors are available to suit the needs of your pool. Want a waterfall? Many shapes, sizes and colors of Rock or Stone to make the best waterfall for your yard, garden, or pond. Need a rock placed on your front lawn or perhaps a school needs a granite memorial rock to be engraved, we can help you get that done. From Montauk to Manhattan, we can deliver right to you or feel free to stop in with your truck. Rocks usually weigh about 125 lbs per cf (cubic foot). So a rock measuring 2 ft x 2 ft x 2 ft = 8 cf. 8 cf x 125 lbs per cf = 1,000 lbs (1/2 ton). Skyview Stone has a knuckle boom crane truck, which can deliver and set rocks at locations. The truck can place a 3,000 lb rock up to 20 ft from the truck's side. 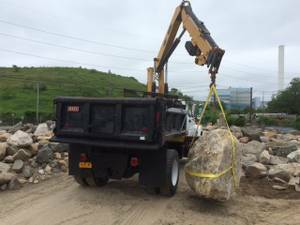 Crane truck delivery charge is a minimum of $300 for (1) rock delivered within 10 miles of our location in Kings Park, NY 11754. Sometimes same day delivery is possible. Send us a picture of where you need the rock set, or bring it with you when you come pick out your decorative rocks and stone. Standard dump truck delivery is $60 within 4 miles of Skyview Stone location. Nassau border delivery $200, Queens border $300, Brooklyn border $400, NYC - Manhattan delivery $600. Many of our customers bring a truck or trailer which we can load for them. Home Depot rents truck for approx $50 for 4 hours. We can place boulders on the borders of your property to keep vehicles off your property. Come down to Skyview Stone which is on 2 acres, and pick out rocks you need cut, engraved, or a plaque installed on. Waterfalls work well when holes are in rocks for the water supply, and at Skyview Stone we have alot of rocks which already have drill holes in them. When the rock is blasted free from where it was mined, they use dynamite, so some of the drill holes are still intact. So pick out a rock you like with the hole already in it, so you save time and money. We sell rocks for School Monuments, Spirit Rocks, Memorials, Diving Rocks, and Waterfall Rocks.